Folks, I have gone into hiding again, or so it seems. Well, vacations are on here and my kids are at home, demanding much of my time and plus I have enrolled them in a summer camp at the church which they totally love. Drop offs, pick ups (in the Dubai summer heat) is ensuring that I remain on my toes (and tired and drained as hell). When I am home I plan recipes and shoot videos besides doing all the other chores. I know that a lot of my videos are pending to be posted but you see, being a one-woman army is a time consuming job. I won’t whine again, but instead will tell you how much I am enjoying running around for activities with my kids. My cousins’ kids also join us and it is really nice to spend time with family. Besides this I try and watch as many entertaining videos and movies as I can possibly cram up in my limited free time. More than movies it is YouTube I am hooked on to these days, so much so that I am totally addicted to it. There are either audio books or random stand up comedy shows or lifestyle/cleaning/organising videos that I keep playing in the background when I do mundane chores like washing dishes or folding laundry. Not sure if I’ve mentioned this before in one of my posts but since January I have listened to a lot of audio books and I totally love this concept. I kill two birds with one stone and this otherwise boring time is spent productively. To be honest, I have become pretty lazy to come and open the laptop to type out a recipe. But fret not, I have piles of recipes lined up that I have been trying and waiting to post and hopefully once school starts I will be more regular. Till such time, please bear with me! Coming to recipes, this one has been tried out at least thrice before I decided that it was fit for the blog. I found the recipe here when I was looking to pair it with pav/pao (dinner rolls) that I had made and posted sometime ago. The dish is more Pakistani than Indian and is called ‘bhuna’ which means ‘slow roasted’ or ‘fried’ not without a reason. 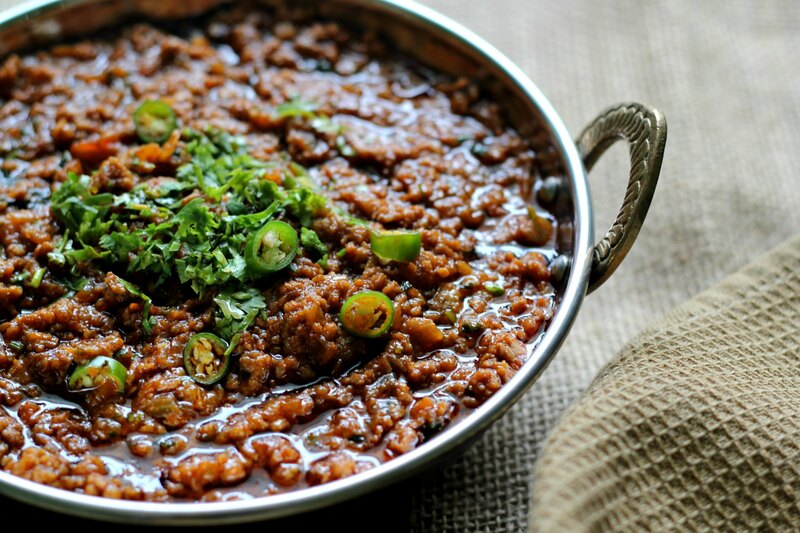 Bhuna Keema uses some extra oil that we are normally accustomed to using so do make this your occasional indulgence. However, if you reduce the oil then make sure to fry the onions in a wide based pan. Crowding them in a small pan without adequate oil will change the cooking technique. They will steam cook instead of getting fried. Whenever I make it to be eaten with pao, I add a little water to make a thick gravy so that it can be mopped up with the cottony soft pao. I had made this dish when I first made the pao but didn’t shoot pictures. When I got around to making the perfect pao, I forgot to shoot separate pictures of the keema so I had to cook it again. I really hope you like making this dish. We totally love it with buttered, pan fried pao – just so delicious I tell you! Don’t forget to save this recipe on Pinterest! and while you are there, do follow me! A rich and delicious accompaniment to pav/pao (dinner rolls), chapathis, roti, naan or pulao. Lightly rinse the minced meat and place on a fine slotted colander to drain. On a skillet, dry roast the cumin and coriander seeds separately. Remove and let them cool for a few minutes before grinding them to a fine powder. Keep aside. Heat 1/2 cup oil in a wide, heavy based wok/kadai and fry the onions till they turn translucent. Then add the dry roasted cumin-coriander powder, cinnamon, cloves, black cardamom, pepper corns and green chillies (if using) and fry everything on a low heat for a couple of minutes. Add the ginger and garlic pastes and fry for half a minute or till the raw smell vanishes. Then add the chopped tomatoes and fry very well on a low heat till the oil begins to separate. This step is very important. Next, add the minced meat and fry it well. Do not add any salt at this stage as it will make the meat ooze out water, so fry on a low heat for at least 8-10 minutes. When the meat is almost done and it looks dryish, add salt to taste and the tomato puree if required. Drizzle a few drops of lime juice and add more only if required. Continue to cook for a minute or two before adding the chopped coriander. If you want to simplify the dish and cannot dry roast the cumin and coriander seeds, you can just use 1-1/2 tablespoons coriander powder and 1/2 tablespoon cumin powder. Just checked your blog and loved it! The photo speaks for the taste and soft pav would taste amazing with this Bhunna Qeema. This recipe looks yummy!!! 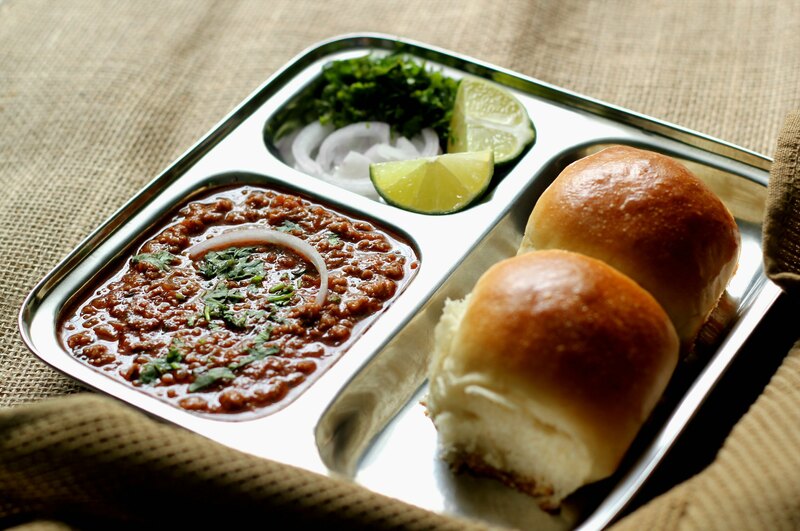 I had keema pav for breakfast at an Iranian restaurant in Pune ages ago and have never forgotten how heavenly it tastes!! Thanks for sharing the recipe!! This recipe looks delicious, i have a question though can this be made the same way for chicken mince as well ? 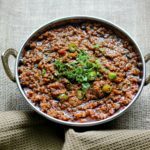 Yes, you can make the recipe with chicken mince as well but you may not need to fry it for so long as it may turn the mince chewy as chicken cooks faster. So reduce the cooking time and it should be good! 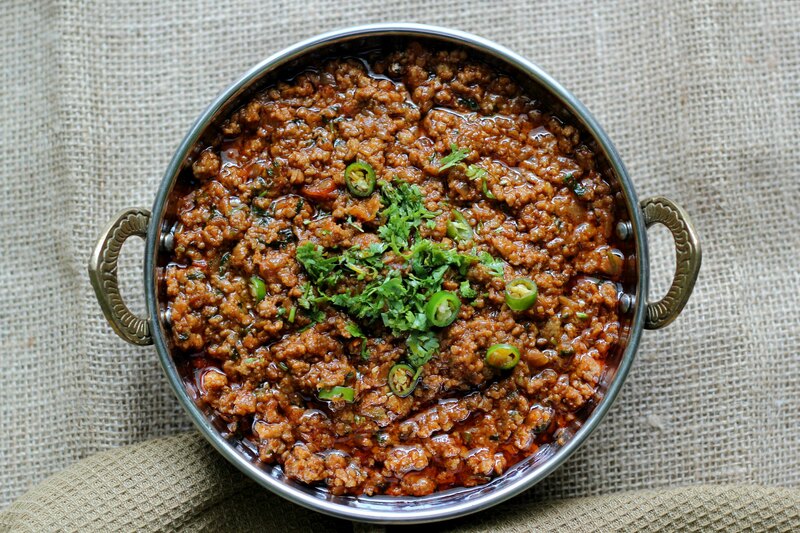 I prepared your yummy and extremely delicious Bhuna Kheema the second time and it tasted amazing as ever. 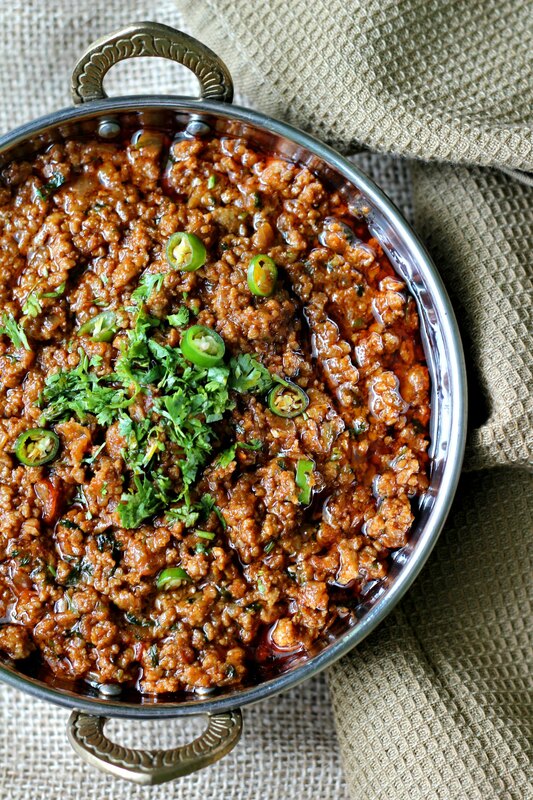 I love relishing this kheema with soft pao, dinner rolls or chapatis. 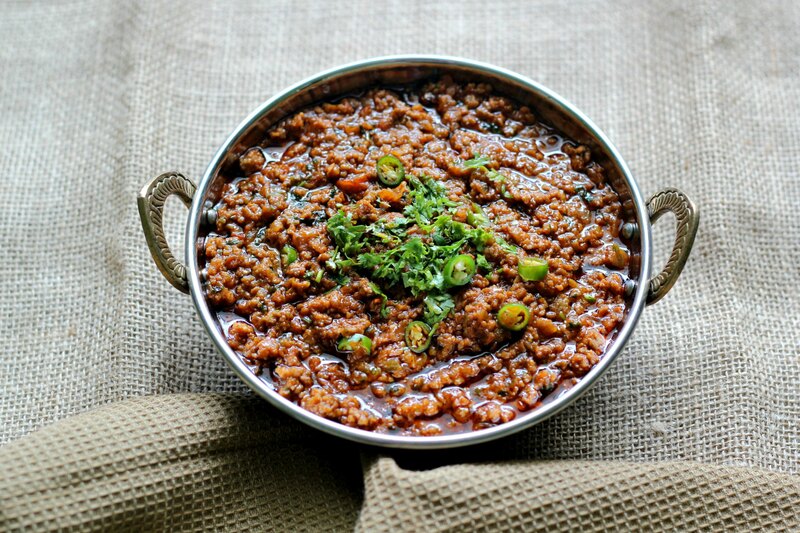 This kheema recipe is the most tastiest I’ve ever had. Hope you post more such recipes. Please post a nice spicy rich thick gravy mutton masala recipe in restaurant style. Also rogan josh mutton recipes made with whole red kashmiri chillies and lots of spices and oil. Thank you so much for the feedback!! And I will certainly post more of such recipes!! I have noted down your request for the thick mutton masala recipe and rogan josh recipe too! I hope to try out some recipes soon and will definitely share them here just for you!